Calderdale Staying Safe, the Domestic Abuse Support Service has released a flyer that can be downloaded here and printed to give the latest information on how to contact them, 01422 323339 Monday to Friday 9am-5pm. The leaflet also includes the out of hours number. In an emergency, call 999 or to report an incident to the Police, please call 101. Staying Safe has a skilled, experienced and diverse staff team who speak other languages or will make every effort to find language support through interpreters. 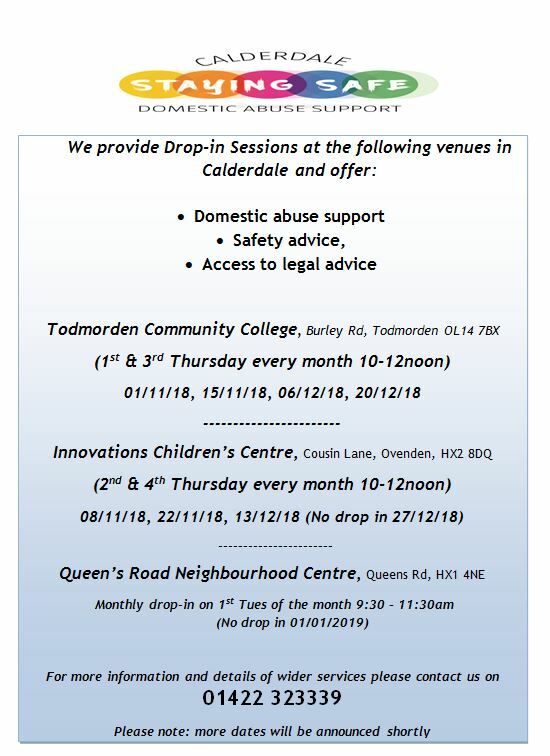 This is a free and confidential service to anyone aged 16 and above, who has been affected by domestic abuse and who lives in Calderdale. Support is available to people regardless of their sexuality, gender, disability, religion or ethnic origin. There are dedicated male and female support workers. Download the Calderdale Staying Safe Flyer. This entry was posted in Brighouse, Dec, Elland, Greetland & Stainland, Health, Hipperholme & Lightcliffe, Nov, Rastrick, Sowerby Bridge, Staying Well, Young People and tagged Calderdale Staying Safe. Lower Valley Friday Flyer 2 November – OUT NOW! !